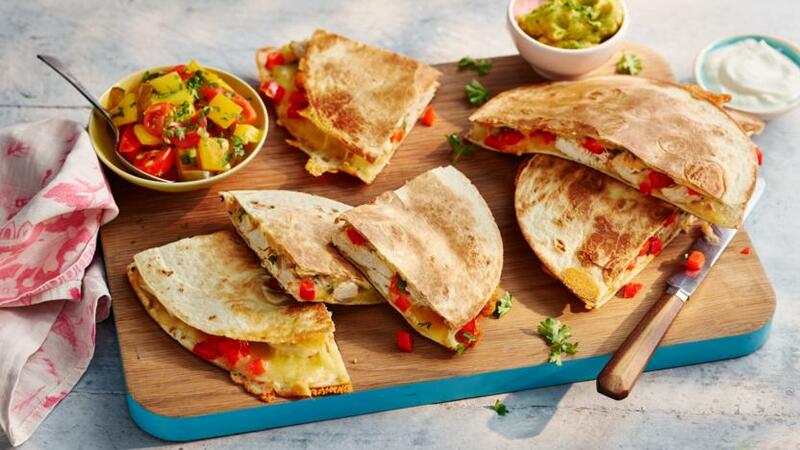 Make quesadillas in 10 minutes with this quick and easy Mexican-inspired recipe from The Hairy Bikers. For the salsa, mix all of the salsa ingredients together in a bowl and season to taste with salt and freshly ground black pepper. For the quesadillas, lay two of the tortillas out on a flat surface. Top each with the cheese, followed by the chicken, peppers and coriander. Place the remaining tortillas on top and press down gently. To serve, cut the quesadillas into quarters arrange on plates. Spoon a little soured cream on top, garnish with coriander and serve with the salsa and guacamole on the side.